HOT dayum Track Alert !! 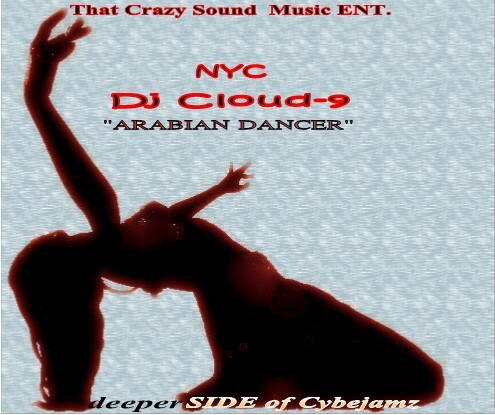 That Crazy Sound Music Entertainment & NYC Dj Cloud-9 presents: Arabian Dancer coming end of May 2018 to deeperSIDE of Cyberjamz. As the Summer closes in we at deeperSIDE of Cyberjamz Headquarterz are not holding back any punches.This time around Anthony McCloud – NYC DjCloud-9 delievers to us a jam packed cut dedicated to the dance floors across the World. Bangin sounds from the drum-kit to the Arabian Chants vocals ,this track was made for dancers and is the primarty objective of such a slammin production.Be on the lookout for his upcoming “Crazy Sound of Music E.P” which is a collection of some serious dance floor pieces amoung other nice surprises which will be revealed during the shows in the upcoming weeks.